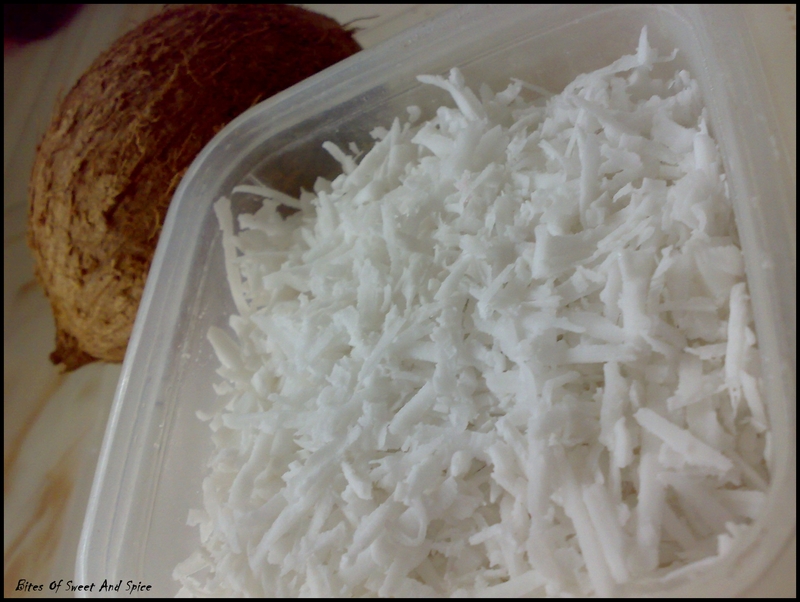 Add the grated coconut. Continue cooking on low heat, stirring frequently until the milk almost dries up. The mixture will start coming away from the sides of the pan. This will take around 20 minutes. Do not dry the mixture too much else you won’t be able to make balls. What you can do is; when you think its ready take a small amount of the mixture and try to make a ball. If you find it too moist then cook for slightly longer. Switch off the heat and let the mixture cool slightly. When still warm to touch, make small balls by rolling between your palms. 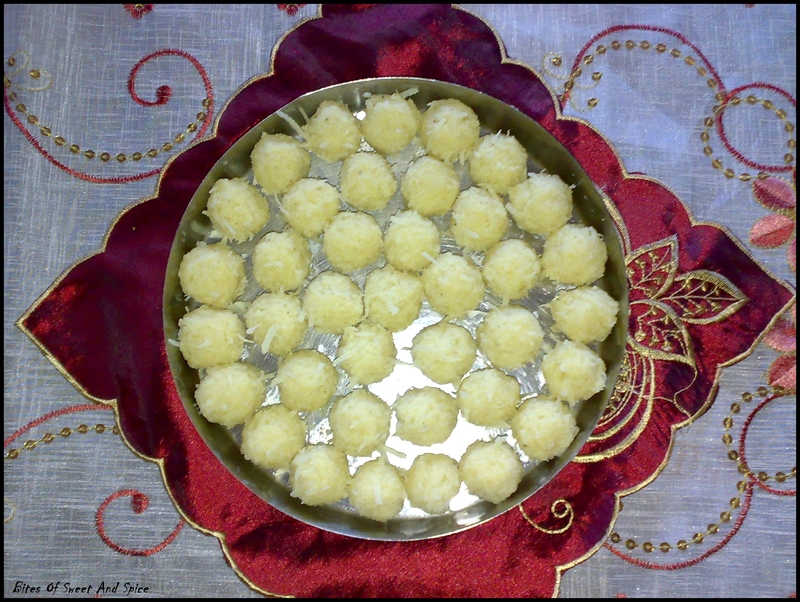 The ladoos will dry up and become firm once completely cooled. 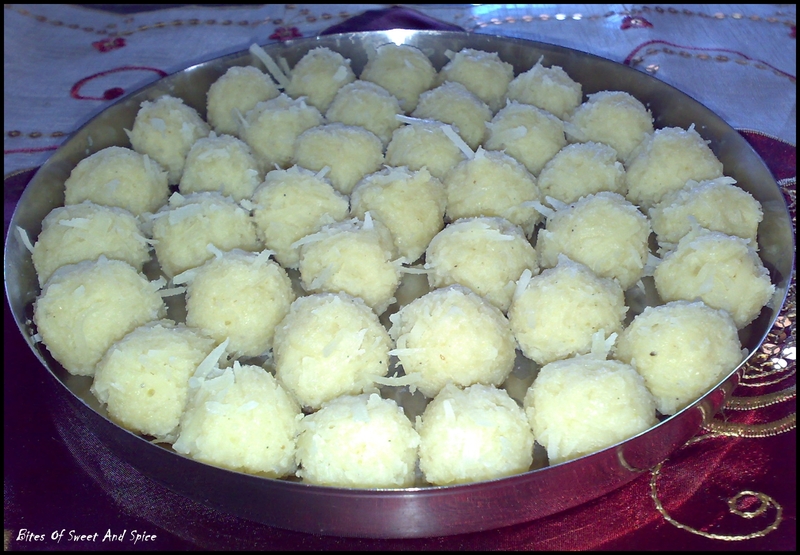 Store the coconut ladoos in the refrigerator. These keep well for several days. 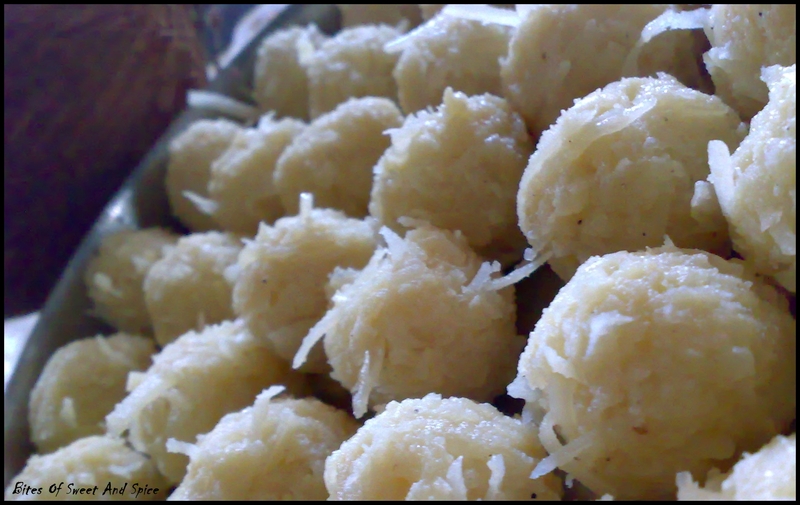 This entry was posted in Coconut, Fruits, Pastries, Sweets and Candies, Vegetarian and tagged Bengali, Candy, Coconut Ladoo, Coconut Snowballs, dessert, Indian, Ladu, Milk, Navratri, Sweets. Bookmark the permalink. Those sound so good! I love coconut too. Thanks! 🙂 I have a cat who loves eating fresh coconut cream! I guess this is not something unusual. We had so many coconuts growing in our garden when we lived in Mauritius and my hubby made beautiful candles and the like from the shells – sadly I never really made anything with the coconut though. These look lovely. The coconut water and cream are absolutely refreshing. We have few trees in our yards; the coconut are ready just in time for summer! 🙂 The thick coconut flesh is obtained when they are left to mature longer on the trees. It is kind of hard to peel and remove the tough outer part though. Ooooh, this looks so interesting and I’m sure it tastes amazing. I had the good fortune to attend a Hindu wedding a few years back and tasted some wonderful bits and dishes not usually found in restaurants, including a sweet that had coconut and rose water…am wondering if this might be the same. Lovely. Ha! I’m sure you are correct as once I read your comment I remembered (this was 15 years ago in my defense) that the beverage was a rosewater flavor and the sweets were coconut. My husband has confirmed this. I imagine that your ladoos are terrific! Ohhh.. I can imagine how amazing a rosewater flavoured beverage must be! 🙂 It is something relatively new to me and I tend to add rosewater to my sweet dishes on every occasion possible; just to tell you how much I love it! Hi, This looks absolutely delicious. I love anything with coconut. They really look inviting. Thank you! 🙂 I’m glad you liked these.